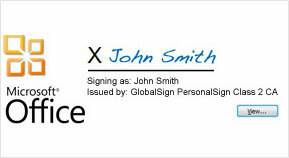 PersonalSign is GlobalSign's range of Digital Certificates used to prove your electronic identity. PersonalSign Certificates are available in a number of "classes". Each class represents the level of identity verification - from simple email verification to full identity assurance. PersonalSign Certificates allow individuals and organizations to represent their digital identities through the use of digital signatures in many applications - from secure email to two factor authentication to document signing. 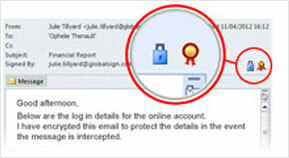 PersonalSign Certificates allow you to digitally sign and encrypt emails to protect the data in transit and only allow intended recipients to read your email messages. Compatible with Microsoft Outlook and other S/MIME compatible email applications. Digitally sign Microsoft Office documents to confirm that you are the author of the document and prove that the document has not been tampered with. 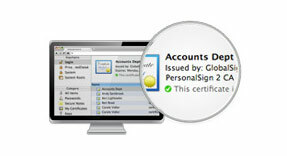 Manage all your PersonalSign Certificates from a single platform with the ePKI solution. ePKI is a simple, easy to use web-based portal which can be accessed around the clock to issue, reissue, renew, revoke or report on all the Certificates used across your organization. ePKI eases the usual complexities of PKI deployment and offers administrators and end-users significant cost and time savings.